The following itinerary outlines an 7-day charter adventure starting in Loreto and heading south through La Paz. 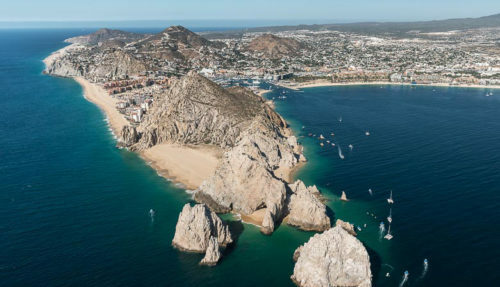 The ideal Sea of Cortez experience is found in exploring the 205 nm stretch o water between the coastal towns of Loreto, La Paz and San Jose del Cabo. 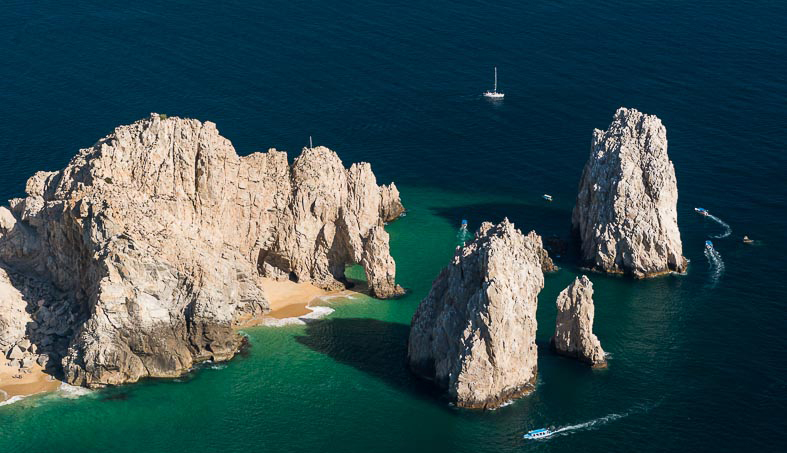 Sheltered by the 900-mile Baja Peninsula, the Sea of Cortez is a natural wonderland where your party can enjoy world-class fishing, diving and snorkeling while taking in the breathtaking surroundings of tranquil desert islands, secluded coves, red volcanic cliffs, winding mangroves, enormous sea caves, deserted white sand beaches and pristine sapphire water. 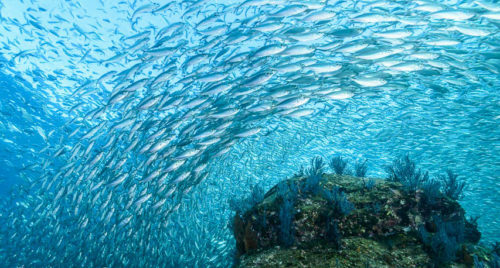 The Sea of Cortez contains one of the worlds most diverse marine environments containing over 900 islands with 244 under UNESCO protection as World Heritage Bio-Reserves. 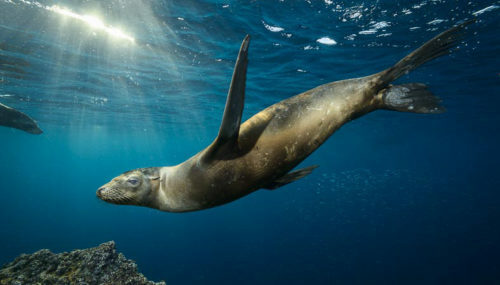 The natural sea life can range from 50-ton sperm whales to colonies of sea-lions, breaching humpback whales, airborne manta rays and curious dolphins. The area is also know for Marlin, Wahoo, Dorado and Tuna fishing. Arrive in Loreto: Transfer 6 nm from the dock in Loreto to the beautiful, unspoiled volcanic island of Coronado in the Intrepid, where you will board the yacht anchored off the beach in turquoise warm water. The beach will already be set up for your arrival and you will just need to change into your swim suits and jump right in! The island is an important piece of the ecology of the Gulf of California. In 1940, marine biologist Ed Ricketts, together with his friend, author John Steinbeck, conducted an expedition and collecting trip in the Gulf of California (sometimes known as the Sea of Cortez) to explore the rich ecology of the intertidal zone. Coronado Island and the Bahia de los Angeles were part of that expedition. The resulting book by Steinbeck and Ricketts, The Log from the Sea of Cortez, remains a classic document of the natural history and ecology of the Gulf of California. Isla Coronados is a wonderful spot for snorkeling, fishing and hiking. The island is surrounded by bright turquoise waters and soft sand beach. A trail leading up to the volcano from the beach, just northeast of the sand spit is perfect for those wishing to stretch their legs and work up a sweat. During late spring and summer months, when the Sea of Cortez warms, Dorado fishing is exceptional in this area. Cruise north about 17 miles to the crystal clear blue and turquoise waters of Honeymoon Cove. The narrow island is ideal for hiking and exploring and offers plenty to see for kayakers. Trailheads can be found at any of the 3 lobes of Honeymoon cove. The vistas of the Sierra do la Gigantic range can be explored from these diverse trails. The anchorage provides crystal clear waters ideal for diving and snorkeling. After a short 22 mile cruise the yacht will arrive in the peaceful yet vibrant fishing village of Aqua Verde. The village is set against the soaring, jagged peaks of Baja California’s Sierra de la Gigantic mountain range. The local people are welcoming and friendly. The village features a local goat dairy farm with many shops making it an ideal stop for re-provisioning. The surrounding mountains and green water are a highlight of the area. 51 miles up, the yacht will anchor at the National Park Isla San Francisco. The island is known for it hiking and scenery. Featuring a beautiful crescent shaped bay, fine white sand beaches that accentuate the crystal clear, blue waters and burnt-red cliffs the Isla is perfect for snorkeling and relaxing on the beach. Just 14nm north of La Paz sits Isla Espiritu Santo and Isla La Partida, considered the crown jewels of the islands in the Gulf. An isthmus joins the two and depending on the tide you can either walk or take a small boat from one side to the other. The front side of the islands is lined by a series of fingers and bays, each one with its own claim to fame while staying equally beautiful. The sand bottom and shallow depths bring out a light and transparent aqua blue sea color, which reminds many of the Caribbean. Ensenada Grande Beach, on Isla Partida, was voted the most beautiful beach in Mexico by The Travel Magazine and one of the top 12 beaches in the world. The islands are protected under UNESCO as a biosphere and serve as an excellent place to hike, walk, or just mindlessly explore. Los Islotes is famous for it’s sea lion rookery. 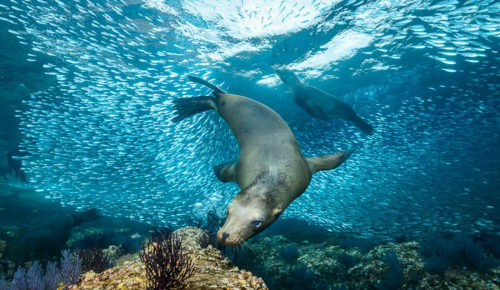 Located just a half mile off the northwest tip of Isla Partida, snorkelers and divers frequent this rocky cove to experience the beauty of the sea lions swimming with their cubs. 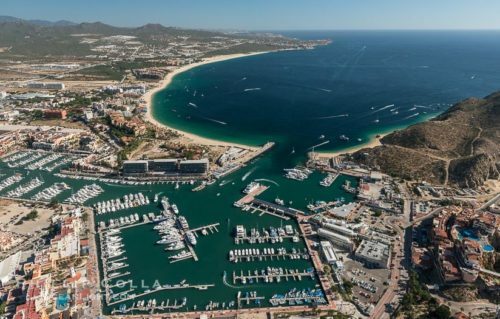 Ensenada Grande is a great anchorage drenched in natural beauty. Beautiful views up a small hill from the beach give way to a close look at the limestone caves and inland vegetation. Puerto Balandra is a picture perfect anchorage with its brilliant white sand and sparkling waters. A great lunch or overnight stop before our arrival in La Paz. Surrounded by barren desert, La Paz is set amidst ancient laurel trees and coconut and date palms. The city is laid out in classic grid fashion with streets radiating from the city’s northwest facing waterfront (Paseo Alvaro Obregon). Running parallel to Paseo Obregon is the city’s lovely malecon (waterfront promenade). A few blocks inland is the main square with its pink quartz gazebo, tiled walkways and 19th century cathedral. El Mogote, a flat deserted sandbar, sits offshore. Finishing the cruise the yacht will makes it’s way the last 20 miles to La Paz. On our arrival, Aquavita will anchor near the city center and we will transfer you to the shore with the Intrepid for your short journey to the La Paz International Airport.